Ringing Cedars - Pine Nut Oil. 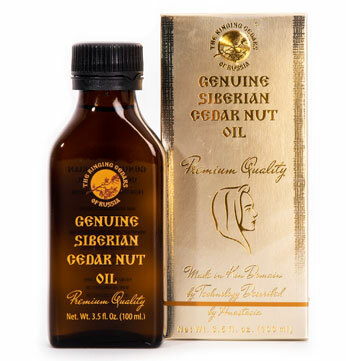 all cherish Siberian pine nut oil? Pine Nut Oil: The Secret is out! Cedar products have apparently been cherished by ancient royalty such as King Solomon, Pharaoh Tutankhamen and even the Sumerian Gods for their health benefits, along with appreciation for the wood of these mysterious, ancient trees. And yes, wild animals are just as smart as royalty when it comes to the best in nutrition. Although the wonderful benefits of the Siberian Cedar tree have been no secret to THE EARTH readers, with the help of physicians and scientists conducting cutting-edge research, the legendary powers of Siberian cedar tree products are now becoming better known to the average consumer. Even the general media are "getting wind" of the taiga giants' secrets. Scientists are busy cataloguing the numerous healing benefits of Siberian cedar tree, considered sacred in most traditional medical lore, and more recently, Doctor of Medical Sciences, Professor A. B. Krivosheev of the Department of Internal Medicine conducted fascinating research with Ringing Cedars of Russia's pine nut oil at the City Clinical Hospital of Novosibirsk # 1, showing how many severe digestive disorders can improve with intake of this miracle healer (see: www.PineNutOil.org). As a consequence of this increasing interest, the Siberian Cedar tree, also known as Siberian Pine, is gaining prominence for its numerous benefits, and its healing qualities are praised as antidotes to almost every modern ailment, including those of an emotional nature. Dr. Regina Jensen, a health-researcher licensed as a physical as well as psychotherapist, has been busy researching Siberian pine nut oil, which she calls a most unique super food. As the editor for Space of Love Magazine, she plans to feature the Siberian Cedar in their forthcoming issue "just like royalty" , she says, because of these legendary benefits as the ultimate healer. "It's uniqueness" , she says, "come from the fact that every part of the tree has some kind of health benefit for humans, animals and even the plants which grow around them." A growing number of savvy health food consumers consider it one of the best super foods, such as boxer Vasily Jirov who was Champion of Kazakstan more than once, Champion of the USSR as well as of Europe and Asia, World Champion, and Olympic Champion at the Atlanta Games in 1996. He holds the world title among professionals of both the International Boxing Federation (IBF) and the North American Boxing Organization (NABO). Jensen, as a psychotherapist, is interested in just that unique quality of this apparent super food, namely of the tree "having a soul" , as biologists have put it, which goes right along with ancient legends. Why? It appears that the tree has biological rhythms very similar to those of humans, responding to changes in its environment much more flexibly and spontaneously than other trees. "In herbal lore of East and West, a plant's looks or behavior are very often related to the benefits it can bestow," says Jensen, "so it comes as no surprise that the gifts of this tree can help us come back into rhythm with our selves, each other and the life all around us." Boxer Jirov's "politeness, humbleness, and character really do exceed expectations," said interviewer Koza, and part of this surely is just that, Jirov's wonderful personality. But in a world such as competitive sports, especially fighting sports, it is wise indeed to take measures to protect such great human qualities with the right kind of nutritional support. The Pine nuts and pine nut oil are also said to eliminate psychological unease and restore "a sense of self-confidence and joyfulness. " Dr. Jensen became interested in Siberian pine nut products for her health center, but also for personal use, because of their unique fatty acid profile. With a family history of high cholesterol because of fatty acid metabolizing difficulties, she praises the Siberian pine nuts' benefits as very unique. "For people who are committed to the best super foods they can find, this is such a unique treasure. "True health foods are rare any more," she says, "because there are so many inferior, lifeless supplements sold out there." The wild harvested, cold pressed Siberian pine nut oil which she uses is first pressed only. "I only know one company so far which produces these products and especially the cold pressed oils with the exquisite integrity they need, namely Ringing Cedars of Russia. They even have an ingenious way of certifying the wild harvested, first pressed quality of its pine nuts and pine nut oil." Jensen, with her difficulties of metabolizing fatty acids such as the common fish or flax oils, uses the pine nut oil in a unique way indeed, namely by applying it all over her body - an ancient way of "feeding" the blood, she says. (Read More on CEDAR THE HEALER) When people were very ill and intravenous life-saving measures had not been invented yet, rubbing the body down with nutritious oils was one way of supplying nourishment and strength to the body. And, she says, its unique cosmetic qualities keep her skin young and beautiful all at the same time. "Best of all," she says, "about five minutes after I apply the oil, without fail, a surge of happiness rushes through me." And she wonders: "Is that my own soul, happy for the extra support, or is that the soul of the Siberian Cedar?" Maybe the answer to that question will remain a mystery of the wild, Siberian taiga? 70% of these are essential and relatively essential, which indicates the high biological value of proteins. While arginine (up to 21g/100 g of protein) is considered replaceable in the diet of an adult person, it is considered essential in the case of children. First among nitrogenous substances are the proteins, which in turn are characterised by an elevated content of amino acids, especially arginine. These amino acids are extremely important to development of the growing organism. Hence cedar nuts have been essential in the diet of children, teenagers and pregnant women. Nut protein is easy to digest. Pine nuts contain valuable lipolytic vitamins E and P . E-group vitamins, or tocopherols, are very important and essential in ensuring complete genetic heredity. (The word tocopherol in Greek literally means "I bear offspring" . ) A deficiency of Vitamin E upsets the fatty balance in the system. Vitamin E is responsible for the production of milk in nursing mothers, and its deficiency can stop lactation. A person's predisposition to atherosclerosis can also be explained by a Vitamin-E deficiency. Pine nuts contain a complex of B vitamins, which normalise the activity of the nervous system, have a favourable influence on the growth and development of the human organism, and improve blood composition. Young wolves delight in feasting on cedar nuts during exfoliation. Cedar nuts are used by both carnivores and herbivores, and are an effective antidote to vitamin deficiency, which causes serious disorders in the system. 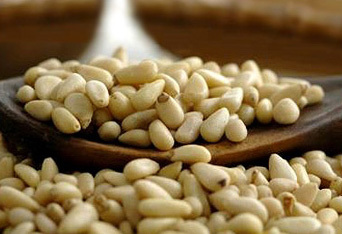 Pine nut nuclei are rich in valuable mineral substances and micronutrients. The food value is confirmed by the chemical composition of the cedar nuts. They surpass all other nuts as well as oil seeds in terms of phosphatidic content. As the richest source of lecithin they are comparable only to soybean. Cedar nuts are also a rich source of iodine, which is very important to residents of northern latitudes. A. B. Krivosheev Doctor of Medical Sciences, Professor of the Department of Internal Medicine of the City Clinical Hospital of Novosibirsk # 1, "REPORT of a Clinical Trial of Siberian Cedar Nut Oil Bearing the Ringing Cedars of Russia Trademark in the comprehensive therapy of digestive, stomach, and intestinal disorders" Novosibirsk, Russia 2008.